Kim and her family survived one major ordeal only to face new challenges landing on a small island short of the island of Pulau Bidong, Malaysia. Two days and nights later they would land on Pulau Bidong and begin an eleven (11) month odyssey on the island. Hard to believe their flight and their plight was perceived a blessing, but a blessing none the less. There were thousands of their neighbors, friends and relatives who were less fortunate. Young children, who’s parents had bought their freedom fell victims to pirates, were raped, had their possessions stolen, were thrown overboard or perished from malnutrition or starvation. Those who remained behind in Saigon, with children too young to travel or couldn’t afford to buy their freedom met similar fates. Pulau Bidong, one of the scenic and uninhabited islands off located off Kuala Terengganu, is often remembered as the temporary home of the Vietnamese boat people who fled their war-torn country in the 1970s. 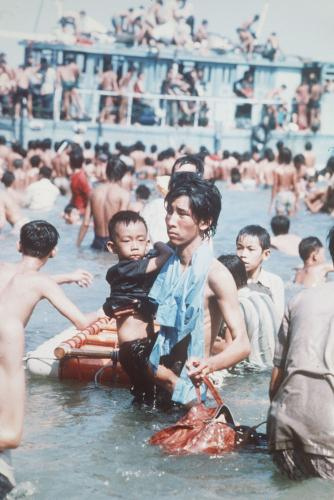 Out of the estimated 800,000 Vietnamese who left their country during this period, the biggest proportion, more than a quarter of a million, landed on their shores. Although the island has the capacity to provide shelter for 4,500 refugees at any one time it took up to as many as 20,000 people at one stage, at the height of the arrival of the boat people. Pulau Bidong served as a half-way house for these people before they were sent to other countries, including the United States, Canada, Australia and several European countries, and it took time to grant approval to those qualified to be accepted as refugees. 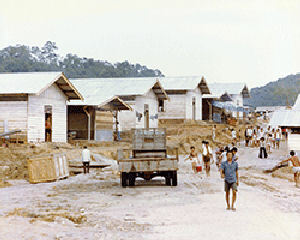 Those whose applications were rejected were sent to the Sungai Besi Refugee Camp, where they were later forcibly repatriated back to Vietnam after the war. Long-houses and offices made from wood from the local forest were built and the boat people were provided with better basic needs and amenities such as food, schools, workshops, electricity and water. Perhaps to make it just like home, the camp was subsequently turned into a bustling mini Saigon. It had the trappings of a township – post office, church, temple, tailors, hair salons, sundry shops and even disco and bar. One part of the beach was even named Pantai Cina – China Beach – after its more famous counterpart in Vietnam. Later I had learned the aid ship following us was a World Vision Missionary ship. Approaching land, our boat had stopped once the propeller had stuck in the sand. The boat had begun to tilt. Someone had yelled “get off the boat as quickly as possible.” The boat was taking on water. The men got off the boat and assisted the women and children toward the shore. I remembered as I walked toward the beach, my head felt heavier than my body. Once everyone had gotten to shore safely, each family cleared an area for their family and settled on the beach. The women used whatever spare clothing they could find to cover the sand, so the elderly and children could sit down. While everyone was busy setting up camp for the night, I looked out at where the boat had been. Within minutes, it had sunk tail first. I could not believe it. We were all stranded on this small island with limited food and water supply (of course, I was too young to worry about food or drink, I just thought of how lucky that I did not drown). Some people from our boat started to look around the island and search for help but did not see anyone else on the island. The men continued to look around the island and talked among themselves. The women were asked to occupy the kids. Our caretaker, Anh, told us stories to help us sleep but I could not sleep that night. I heard too many strange noises close by. I stared into the sky. It was clear with plenty of stars out. I looked again to the horizon. There was no remnant our boat had ever existed. As the sun rose a boat with Malaysian soldiers approached. The soldiers told everyone on our boat to surrender all of our gold and valuables to them for safe keeping. They assured everyone that these items would be recorded and returned to us, once we had been accepted by and ready to depart to a new destination. Most of the people on our boat were skeptical and didn’t want them holding their valuables. Finally, the soldiers demanded that if no one surrendered their valuables, we would have to stay on this island until they got what they wanted. So families started to bring a few pieces of gold to the soldiers. My dad quickly told my sister, My, and other sisters to keep some gold hidden under their clothes. My family gave up approximately 50 pieces of gold to the soldiers. At the time, we didn’t know the exact value of the gold. The soldiers wrote something down (in Malaysian) and had each family sign. We had no idea what they had written on those documents. We believed that the gold pieces were as good as gone. My dad just considered it payment so we could leave the small island in peace, a down payment on our future. After this, they left us alone and told us that they would call for assistance. At that moment, everyone was just relieved, happy and excited that everyone had found FREEDOM. Later that day, someone was stung by a poisonous sea urchin. The poison spread so quickly that she went unconscious. The soldiers called and asked for immediate rescue. That evening, the rescue boat came. It only took her and her family and to leave the island first. They would not take anyone else who had been stranded. The soldiers pushed the others away from the motor boat. Someone explained that more boats would be back tomorrow for the rest of us. That news calmed the remaining people. One more night, we spent on this isolated island. The next day around noon time, several boats arrived. We all packed whatever belongings we had left and we headed toward these boats. I remembered treading through the clear blue water and attempting to avoid stepping on jelly fish of all colors and sizes that had covered the island’s shoreline. Luckily no one else got hurt that day. It was a short ride to a larger island called Pulau Bidong, where my family would reside for approximately 11 months. There were plenty of adventures and obstacles to come. As we approached new land (Pulau Bidong), we saw the wood dock. We could see the people on the beach that were Vietnamese by their clothing, which got us all very excited. Side note: We all had thought the boats were taking us to main land of Malaysia. Come to find out, this new home for us all was a refugee camp. After all of us had gotten off the motor boats, each family looked for a spot for our family on the beach to settle. Hunger finally hit my family fast and hard. We were starving. We hadn’t eaten food in several days. We had only drank water or something close to it. There was very little rice left to feed my family of 16 members. We had to cook rice in a broth to have enough for my family to share. We shared a small half bowl of white rice soup between us. We passed the bowl to each family member in turn to sip. My family had never suffered hunger. This was a very humbling and frightening experience. We were a proud family living comfortably to a family starving within a span of 4 days. Since the boat that transferred us to Pulau Bidong was the 23rd boat that had arrived at this camp, it was labeled number 23. The population on Pulau Bidong Island at that time was roughly 40000+ people. Our boat was assigned to the D or B area of the island. This was how the island officials would divide and find the families. That night we slept on a bank along the shore of the island. The next morning, each family was shown to where we were to live. When we got to our new home, it was just a patch of dirt. It was up to us to build a shelter. Unfortunately for my family, we didn’t have the skill nor the know how to build a structure of any kind and we would rely on other refugees to assist us. We were tired, fatigued and hungry. We slept with a plastic tarp for cover. That 2nd night, thunder and lightning woke us, the rain water soaking us beneath the tarp. We picked up our belongings to avoid the rain from ruining them. The rain was so heavy, it poured down the hillside. We all stood till morning and then we had were provide help to start building our new home. My dad and brothers went up the hill to gather woods and branches. My family had many restless nights in the beginning. To top it off, I had chronic Asthma attacks. My family could not get me immediate medical attention. We had to wait until our family was officially registered into the refugee residential list. It took two days for the process to be completed. We were helpless. We went from a well-to-do family to doing things for ourselves. It was very difficult life-altering event for our whole family. Though time was all we had, my family was forced to quickly adapt to our new lives. My siblings and I shared one bed. There were 3 beds total in our home. All of our beds were made with multiple and uneven branches tied together. But it was better than the dirt floor. It was very difficult for my elderly grandmother. She could not sleep on these beds. Later on, she bought a wood plank that came from a wrecked boat. This was used to make a more comfortable bed for her to sleep on. For cooking, we dug a hole and mounted several rocks for a fire pit. Other appliances and supplies, we had to buy with gold or money depending on the sellers. All families received some supplies from the United Nations like rice, instant noodles, and beans. Note: This is why I dislike beans, especially kidney beans. To earn a living, my older siblings would buy and sell fresh fruits and others products from a lady, whom was the longest survivor on this island. This lady would buy her inventory from Malaysian civilians that sail by our island. The island was deemed a gold mine; for without gold or money no one would survive the hard life. There was plenty of price gouging. For instance, one bottle of Coca Cola, which cost 34 Cents, was sold for a $1.00. This was just a small example. There was no employment on the island. So, people created their own jobs. Some climbed the hill and cut trees for trading with those in need of lumber for shelter or for firewood. My oldest brother, Jimmy, took on a risky business. He swam offshore to where Malaysian fishermen boat drifted by. The fishermen would bring different items to sell items such as axes; hand saws, tents, even cookies, which were in demand in our camp. Malaysian police patrolled and would beat or kick the sellers and the buyers of these goods. They would chase off the fishermen. One time, Jimmy had bought 20 axes as the policemen’s canoe was approaching. Jimmy had to jump off the fisherman boat. The weight of 20 axes sank Jimmy to the bottom of ocean floor. He panicked but would not give up. He managed to drag the axes to shore. Lucky for Jimmy with the weight of the axes he sunk quickly, otherwise the policemen would have beaten him with their sticks regardless if he had surfaced too quickly. 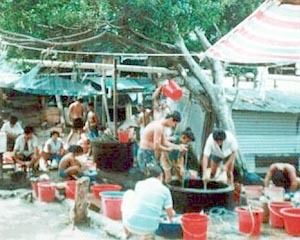 For drinking water, there were only a few public wells which supported the large population on the island. We would travel for miles, stood in a long line. It could stretch for miles and we waited our turn. Once we reached the well, we would gather a bucket of water. Public wells soon went dry. People started to dig their own wells. Before the water system was built, most private wells were only used for bathing and washing. The island was undeveloped and not ready to handle people especially large populations. No sanitary system existed. Heavy rain would contaminate the water supply and jeopardize the fresh water supply, which made everyone’s life more miserable. Later on, the United Nations brought in piping and helped build a water system that transferred fresh drinking water for everyone on the island. My family tried and gradually adjusted to the lifestyle on the island. Yet we would continue to pray and hope for a miracle that some country would sponsor us. My family was low on the list for sponsorship for several reasons. We were not a part of US military services or affiliated in anyway. 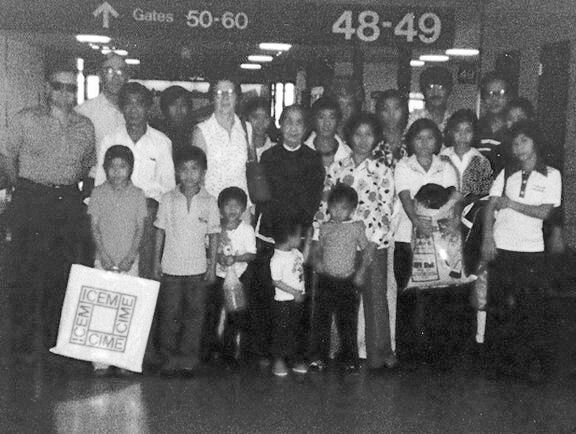 My family was not classified as a priority at that time, the US delegates could not process the sponsorship right away. My family could only hope and wait for acceptance based on a religious sponsorship. The biggest problem was the size of my family. Most groups did not have the financial funds to sponsor 16 people. Our lives on the island were like the movie Groundhog Day and seemed hopelessly mundane. We all lived day-to-day as best we could. Churches and temples were built. W donated wood, tree, and tents. My brothers, sisters and I would spend our spare time by studying Basic English at any church or temple that offered free classes. When the last of these boat people left the island in the early 1990s, what remained were mute reminders of recent history: charred wooden buildings and rotting huts which once housed about a quarter of a million boat people since their first arrival in 1978. Today, the only welcome for visitors to the beach of Pulau Bidong is a barren beachfront stall and glimpses of buildings heavily hidden by overgrown brushwood and bushes. Only emptiness, signboards with Vietnamese characters and names are still on display – ghostly reminder of the past. Wow! Reading what Kim and her family endured definitely puts things into perspective. This is a good read and could be a book. I’d be willing to bet that Kim Tran is an excellent employee, based on her appreciation of life after such a demanding go of it. It’s Reagan’s birthday and I just finished reading his farewell speech. I wanted to share an excerpt that resonates with regard to Kim’s experience. A small moment with a big meaning, a moment the sailor, who wrote it in a letter, couldn’t get out of his mind. And, when I saw it, neither could I. Because that’s what it was to be an American in the 1980’s. We stood, again, for freedom. I know we always have, but in the past few years the world again–and in a way, we ourselves–rediscovered it.